Did you notice a French theme happening on the blog? 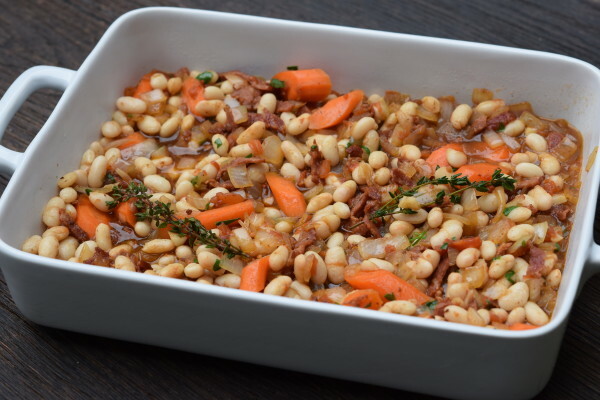 As soon as I remembered the French onion soup recipe I taught a few years ago, it also occurred to me that I had never posted this chicken and white beans recipe which I developed for a teaching trip in Southwest France many years ago. 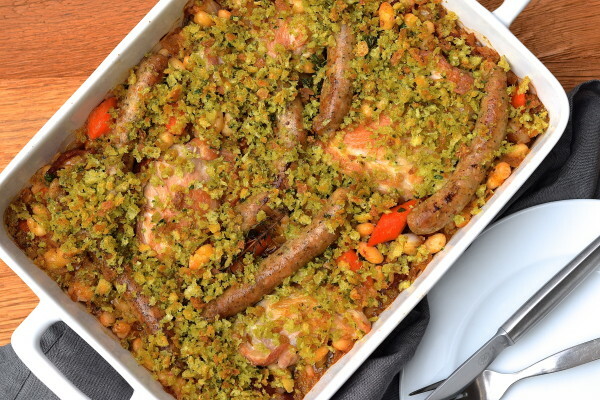 Cassoulet is an incredible, hearty French dish (actually it refers to the recipe as well as the vessel it’s cooked in) with duck confit and sausages and chicken and white beans all stewy and luscious together. It also requires tons of time, like at least a full day +. And I’m not saying it’s not worth it, but it’s not realistic for me or most of the universe to spend that much time on dinner. So I came up with a version that can be made quickety quick on a weeknight and although it doesn’t have the richness and depth of a traditional cassoulet (which coincidentally was posted in the New York Times this week by Sam Sifton — check it out here), this one is also lighter and more in line with how I like to eat, i.e. not feeling super weighed down like I need a 3-hour nap after I eating, which is what I did after I ate real cassoulet in France. 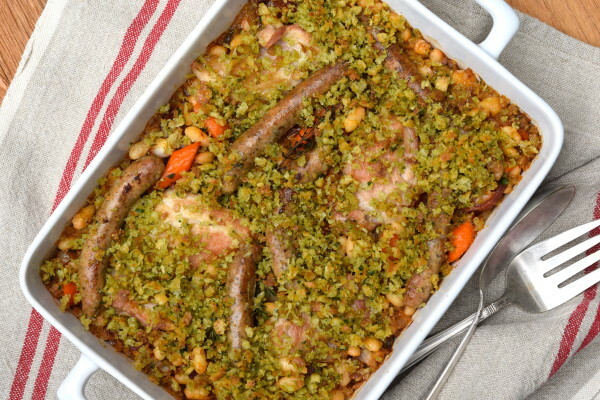 I don’t know what to call this recipe since I know purists out there will turn their noses up at the use of the word “cassoulet.” But I will tell you this — my whole family loves it, even the picky one. And why wouldn’t he? He likes chicken, sausages, turkey bacon and beans, even when they’re touching each other. And for me, I’m not a big meat eater, so I might take a smidge of chicken and scoop up more beans and veggies for my plate. Everybody’s happy! To make this as healthy as possible, choose organic, free-range chicken and freshly made organic sausages without preservatives or nitrates. For the sausages, I just buy whatever is in the fresh meat case at Whole Foods that is organic and made with poultry since my family doesn’t eat pork. I do not buy prepackaged sausages since most of them are loaded with the aforementioned undesirables. Feel free to use pork sausage and nitrate-free pork bacon if that’s what you like. Legumes are one of my favorite food groups and the kids love them, too. So rich in protein, fiber and low in fat, they are also incredibly inexpensive, especially if you make them yourself. But there’s no shame in using cooked beans out of a box or a can. Lately I am favoring Trader Joe’s organic beans in cans with no plastic liner – no BPA, no BPA sneaky substitutes either. Eliminate the bread crumbs if you want, they’re not essential. Add more broth if you want it more stewy. 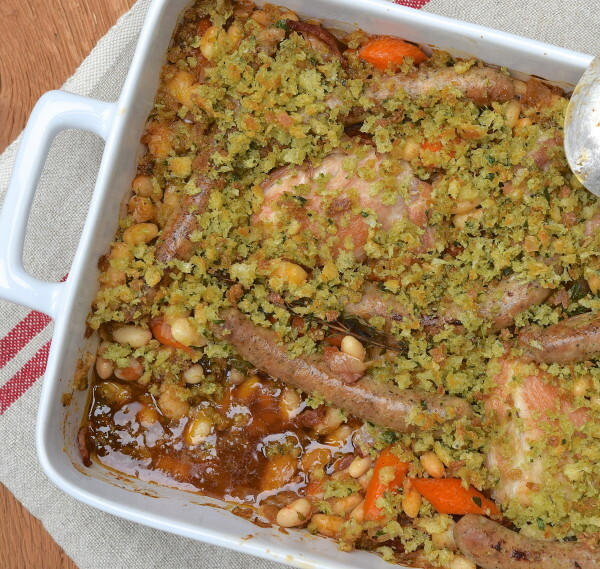 And if you have leftovers the next day, add lots of stock, turn it into a soup and call it “Cassoulet-style Chicken and Beans Soup.” Bon appetit! Warm 2 tablespoons oil a large sauté pan over medium heat. Add the chicken skin-side down or the sausages. Brown the pieces thoroughly on both sides. Make the breadcrumb topping: Place the whole clove of garlic into the bowl of a food processor with the bread and 1 tablespoon of whole parsley. Process until crumbs are formed. Add 1 tablespoon olive oil and salt and pepper to taste. Pulse to combine. Set aside. 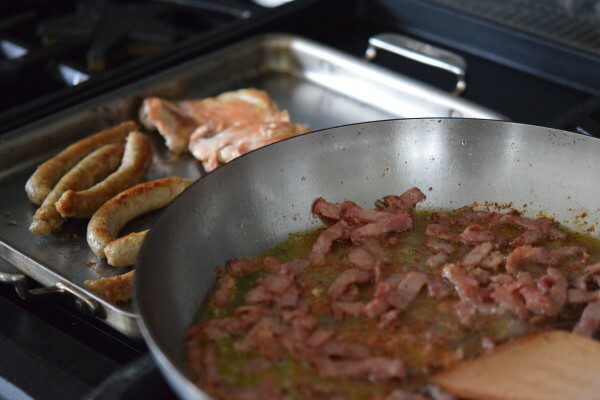 When the chicken/sausages are almost ready, add the bacon to the pan and sauté until the bacon is golden brown. Take the chicken/sausages out of the pan and set aside. 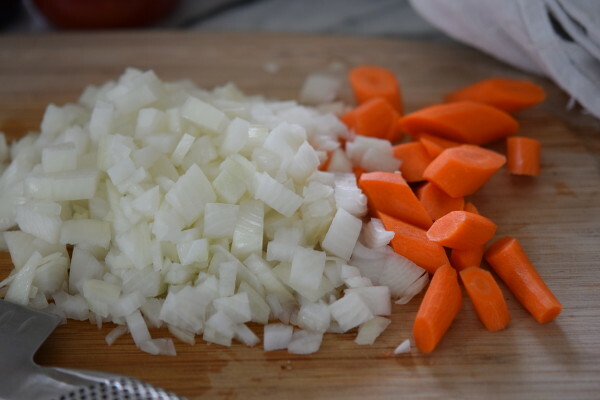 Lower the heat to low and add the onion and carrots. Season with salt and pepper and sauté for 2 minutes. Add the chopped garlic and sauté for another 2 minutes. Add the drained tomatoes and wine and scrape the bottom of the pan to deglaze. Add the vegetable broth, 1 Tablespoon of parsley, the thyme sprigs, as well as the beans. Cook for 1 minute, until broth is bubbling. Transfer the bean mixture to an 11 x 9-inch or similar baking dish. 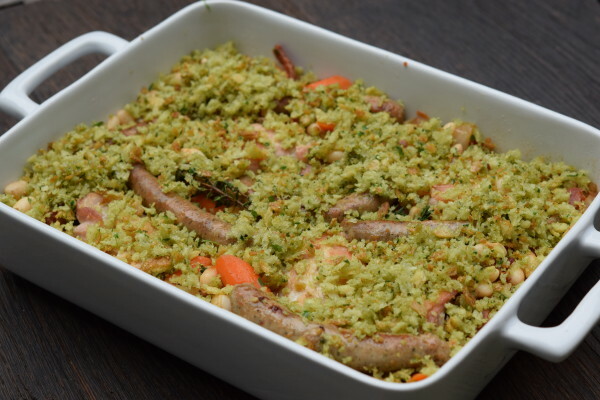 Arrange the chicken/sausages on top, then top with the breadcrumb mixture. Drizzle lightly with olive oil, and bake in the center of the oven for 25-30 minutes, until the sides of the pan are bubbling and golden and the breadcrumbs are toasted and golden brown. If you want to make sure the chicken is cooked through, insert a thermometer into the meatiest part of the thigh and make sure it registers 165 degrees. First, let me say I love the dinner planner. I anxiously look at it as soon as i get up on Sunday before we go to church. I do move the meals around to fit my schedule and I pretty much love everything I have made on here. I did not get to make this last week but I was able to make it tonight. I made it this afternoon and popped it in the oven when we got home from school. It was so easy! And pretty darn scrumptious! My husband would have preferred all sausage but I did add bone in chicken breast because that is what I had. I used the Applegate chicken/turkey Italian sausage. The bean mixture had so much flavor. I could just eat that by itself. On another note, I was at my mom’s yesterday and the Whole Foods in Huntington Beach had whole chickens on sale for $2.29 a pound. I got a 4.31 pound organic chicken for under $10.00. I obviously don’t know you personally but I totally thought of you when I saw the chickens on sale. 🙂 I also found the watermelon radish and used it in our salad tonight. So yummy! I have rediscovered my love of radishes in my salad. They actually remind be of my grandmother because she always put radishes in our salads. Thanks for another really great recipe. And I apologize for the novel tonight. This looks like something that could be fantastic adapted to a crock pot, and finished in the oven with breadcrumbs. Have you tried that or is that for me to experiment? This looks so yummy! Can you make the casserole ahead and bake it later? Also, I notice your photo has chicken and sausage. If I want to use both, should I just half each meat quantity (4 chicken and 3 sausage)? As always, thanks for the inspiration!